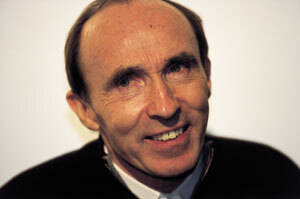 Sir Frank Williams is an inspirational figure within the motor racing community. American racer Sam Schmidt, who was paralyzed in a testing accident at Florida's Walt Disney Speedway last year, admits that his decision to start up as a team owner in this season's Indy Racing League was prompted by meeting Frank Williams. Frank remembers it well. "I met him at Indianapolis last year," he said crisply. "This is a guy in a wheelchair, high level, worse off than me from what I could see. I just explained to him that the only thing you can do is use your brain from now on, and get very active - if you're active in business... just do whatever your passion is." Williams has followed his own advice to the letter. If self-pity or depression have a place in his personal repertoire, outsiders are not aware of it. It clearly frustrates him more that the team that bears his name has been away from the formula one winner's rostrum since 1997. Williams wants that to change, but knows there is no magic to the formula one business, just relentless and analytical hard work. On the eve of the new season he was reflecting on his team's week-long test program at Johannesburg's Kyalami circuit. "We seemed to finish slightly quicker than the BAR-Honda, but we're not sure," he pondered as he considered the merits of what could be one of his strongest rivals battling for third place in the championship behind McLaren and Ferrari. "That bloody car of theirs just went round and round - 106 or 110 laps every day except one. We had more problems than they did." Despite this, he believes that the latest Williams-BMW FW23 could be the car to end the drought. And he cannot contain his excitement at the prospect of seeing just how his latest protege, the Colombian rising star Juan Pablo Montoya, acquits himself in the role of Ralf Schumacher's team-mate and successor to Jenson Button. "They're not mortal enemies. They're grown up enough to know it's stupid to have a war in the motorhome." "He's settled down," says Frank enthusiastically of Montoya. "The pattern (during testing at Kyalami) was more and more consistent. "Ralf was always a bit quicker, but because he's got more experience, all the 'go faster' bits went to him, so it did color the competitive picture. My opinion is that for quite a few races Ralf's going to be slightly quicker, but I could be wrong. I think they'll be very close, the two of them." Much has been made over the past few months of the simmering rivalry between the two men. But Frank is having none of it. "They're not mortal enemies," he says, not totally convincingly. "They're grown up enough to know it's stupid to have a war in the motorhome." So how will Ralf react if Montoya is uncomfortably quick? Williams is clear cut on this; "He'll try harder - an obvious plus for the team. I think all drivers are - quite rightly - all ego-driven. "If he's beaten, I don't think he'll throw his toys out of the pram. It'll be a tough fight for Juan Pablo to beat him, I'll tell you "
Williams has always made it plain that he sub-contracted Button to the Benetton-Renault team for the next two years as he had a prior commitment to give Montoya a chance in formula one from the start of 2001. "We will be watching Jenson's progress very closely - to see how much better he becomes, and also because everyone in this team is very fond of him," he said. "Personally, what I like about him is that, despite the enormous thrust upwards in the cyberspace of fame and stardom, and so on, in my opinion he hasn't changed a jot. A lovely person, I think."